Baskets chinese There are 12 products. Basket picnic chinese or to your liking sewing box. 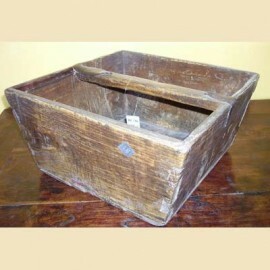 Basket conservation of food.Dimensions: L38 x P38 x H36 cm. Picnic basket tibetan bamboo.Dimensions: L49 x P36 x H30 cm. Basket picnic chinese bamboo.Dimensions: L30 x P22 x H41 cm. Basket picnic chinese Dimensions: L30 x P22 x H41 cm. Basket sewing wickerDimensions: Diameter 30 x Height 30 cm. 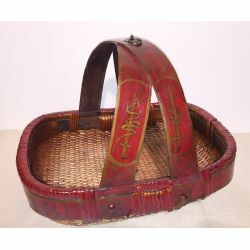 Basket rice old VietnamDimensions: L37 x P27 x H28 cm. Basket picnic area, tibetanINWARD CONTAINER SEPTEMBERDimensions: L35 x P21 x H26cm. 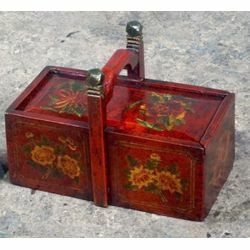 Basket sewing wicker painted motifs of flowers and birdDimensions: L30 x P22 x H17 cm.